CLEMSON, SC – Rod Hall posted a career-high 20 points and Clemson registered its largest point total of the ACC regular season in a 73-56 victory over NC State in Littlejohn Coliseum on Tuesday. The win snapped a three-game losing streak for Clemson, improving the Tigers to 16-9 on the season, 7-6 in the ACC. The Wolfpack fell to 16-10 and 6-7 in league play. Hall was one of three Tigers to reach double figures Tuesday. He made 6-of-10 shots and all eight of his free throw attempts to reach his career-high output. Damarcus Harrison put together his best game of the conference season with 14 points, four rebounds and two steals. K.J. 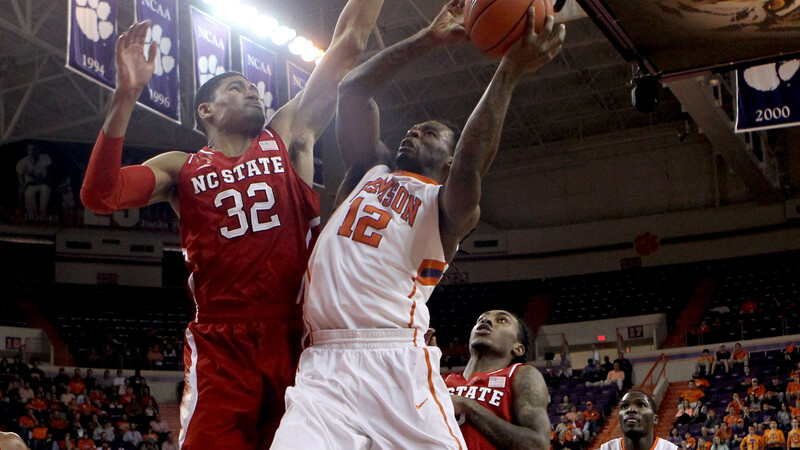 McDaniels, Clemson’s leading scorer, was held to 12 points, but added six of Clemson’s nine team blocks Tuesday. The Tigers shot 48 percent as a team and after watching NC State shoot 55 percent in the opening 20 minutes, held the ‘Pack to just 38 percent shooting after the half. The ACC’s leading scorer, T.J. Warren, posted 20 to lead all players, but was victimized by six turnovers. Clemson scored the game’s first seven points. NC State crept back in it, however, and pulled within five at 13-8, but the Tigers scored six of the next eight points to lead it 19-10 after McDaniels hit a jumper from the short corner. The lead stretched to double figures on Hall’s second three-point play of the half, making it 26-14. But State rattled off a 7-0 run ending with Warren’s first field goal at the 5:14 mark. Clemson struggled down the stretch of the first half, as it saw NC State get in a groove from the free throw line to whittle the Tigers’ lead to one at 30-29. The Wolfpack took their first lead with five seconds left before half on a runout layup from Warren that made it 33-32 in NC State’s favor. The Tigers again came out strong to start a half, scoring 11 of the first 13 points in the second frame. Clemson extended its lead to 11 a second time at 48-37 after Harrison stole an errant pass and drove in for a slam. His points followed a sequence that included a Jaron Blossomgame three and monstrous block by McDaniels. After the lead grew to 14 points at 56-42, Warren rattled off seven straight points to make the arena a bit uneasy. But Clemson responded with a brilliant 12-0 run and held NC State without a point from 9:22 left in the game until the 2:20 mark on a Warren floater. The Tigers return to the road for a two-game trip, playing at Georgia Tech on Saturday and at Wake Forest a week from today. The Tigers and Yellow Jackets tip at 12 noon from McCamish Pavilion.